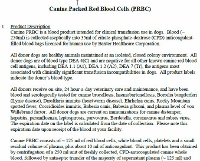 Universal Canine Packed Red Blood Cells are available for purchase at Tin Hau Pet Hospital. All donors have blood type DEA 4 (C) and are tested negative for ALL other known canine red blood cell antigens, including DEA 1.1 (A1), DEA 1.2 (A2) and DEA 7 (Tr), the antigens associated with clinically significant transfusion incompatibilities in dogs. All donors receive on-site veterinary supervision and maintenance and have been serologically screened for canine brucellosis, Borrelia burgdorferi (Lyme disease), Dirofilaria immitis (heartworm disease), Ehrlichia canis, Rocky Mountain spotted fever, Coccidiodides immitis, Babesia canis, Babesia gibsoni, Mycoplasma haemocanis and plasma levels of von Willebrand factor. Our CPRC products have been in constant high demand and availability is on first come first serve basis. Since December 2006, we have been using and supplying CPRBC products to over 40 local veterinary clinics with NO reported adverse reactions. To secure your order, please contact our staff at 2104-2000 during our opening hours.